On Tuesday 24 July, at the Sydney Web Accessibility & Inclusive Design Meetup, Intopia launched a brand new visual map of WCAG 2.1, including the new Success Criteria published just last month. 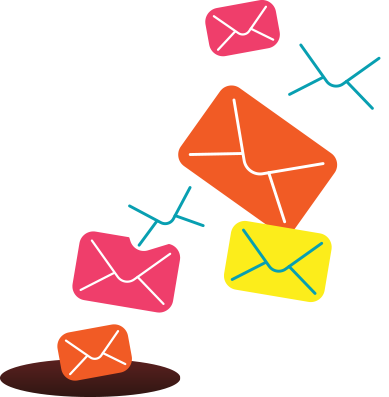 It’s downloadable in digital format as a PDF, which makes it ideal for printing to hard copy. The Map illustrates at a glance where each Success Criterion fits under the WCAG Principles, including its level of conformance. So why did Intopia make this new map? Web Content Accessibility Guidelines (WCAG) version 2.0 was published as a final W3C Recommendation on 11 December 2008 – yep, nearly 10 years ago. At the time, WCAG 2.0 was rightly lauded as a complete overhaul of WCAG 1.0 (itself published May 1999), having graduated from a basic system of guidelines and checkpoints to a more nuanced framework that could be applied to any device, operating system or related technology, hopefully well into the future. To achieve this, the 12 Guidelines of WCAG 2.0 were distributed between four over-arching Principles, which state that in order to be accessible content must be Perceivable, Operable, Understandable, and Robust. Each Guideline comes with Success Criteria that need to be met, and which are ranked from Level A – the most basic level of conformance required, and the most immediately expected – up to Level AAA – the highest level of accessibility, potentially the most problematic to conform to and therefore expected to be met over a longer timeframe. Principles, Guidelines, Success Criteria, Level A, Level AA, Level AAA – this is all getting a bit complicated, isn’t it? 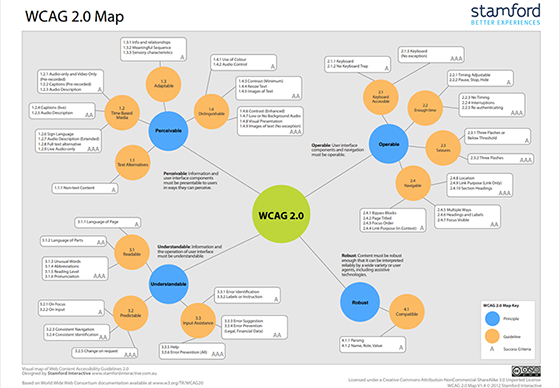 In 2012, Stamford Interactive came up with a map: a visual representation of WCAG 2.0 that laid out where everything sits and how it is all interconnected. Then on 5 June 2018, Web Content Accessibility Guidelines (WCAG) 2.1 was published as a final W3C Recommendation, introducing 17 new Success Criteria. We’re gonna need a bigger map. Download the WCAG 2.1 Map (PDF). You’re very welcome to download it, print it, share it – under the terms of Creative Commons licence Attribution-ShareAlike 4.0 International (CC BY-SA 4.0). 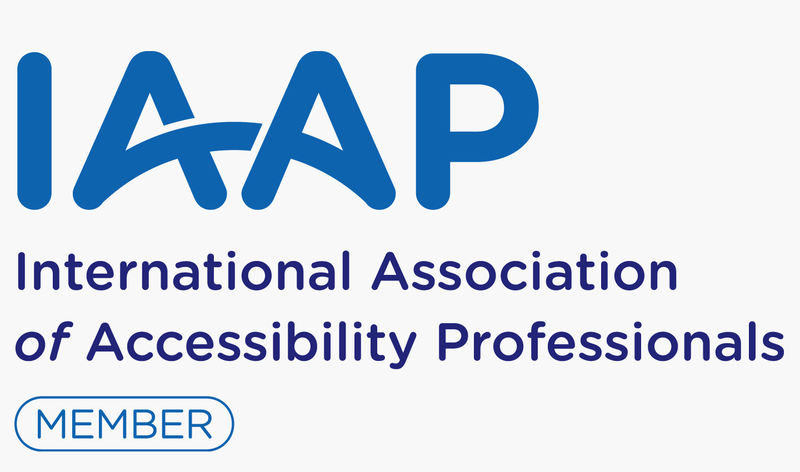 We have also created two audio description versions of the WCAG 2.1 Map; a short version (7 minutes) which explains the Map, and a long version (15 minutes) which provides an extended explanation of the Web Content Accessibility Guidelines, incorporating the Map. 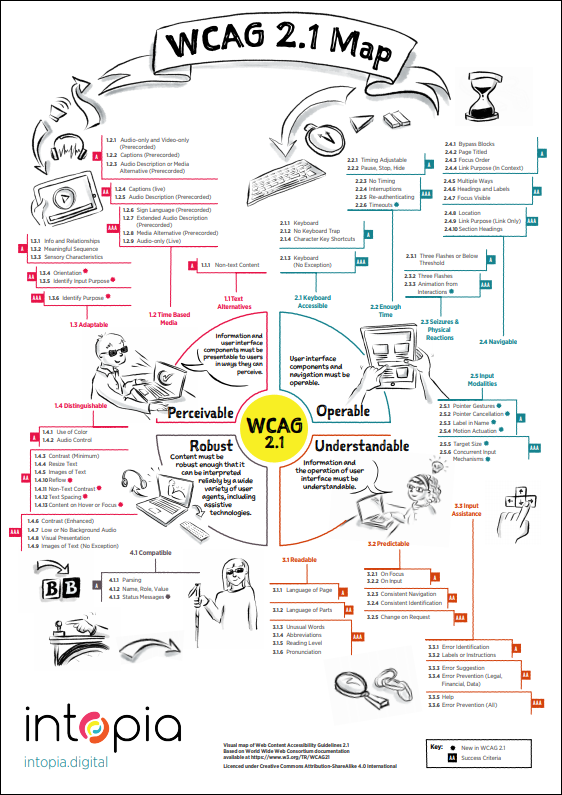 We hope it helps everyone understand WCAG 2.1 a little better. If you or your organisation requires some professional assistance in understanding how WCAG 2.1 applies to your activities, please contact us – we have a suite of services to help you out.